Two of the fan-friendliest festivals in Chicago’s packed summer season are combing forces this year, with the annual Hideout Block Party and the newer Onion/A.V. Club Festival taking place on Friday and Saturday, September 14-15, on the wonderfully scene stretch outside the club at 1354 W. Wabansia. The initial batch of acts announced today include Iron & Wine, Glen Hansard, Lee Fields & the Expressions, the Corin Tucker Band, the Waco Brothers with Paul Burch and the Redmoon Theater Company. More to come later this month, but two-day passes are on sale now at $40 plus ticket fees (jumping thereafter to $50 plus fees), with a portion of proceeds going to Rock For Kids, Literacy Works, the Drummond Elementary School and the Oscar Mayer Magnet School. 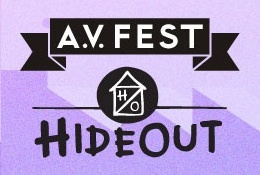 Single-day tickets will go on sale later this summer; for more information and updates, visit www.hideoutchicago.com or www.avclub.com/fest.